Popular taco pop-up at The Larder was a hit this summer. Figures. I finally get to taco night and it’s the last one of the season. 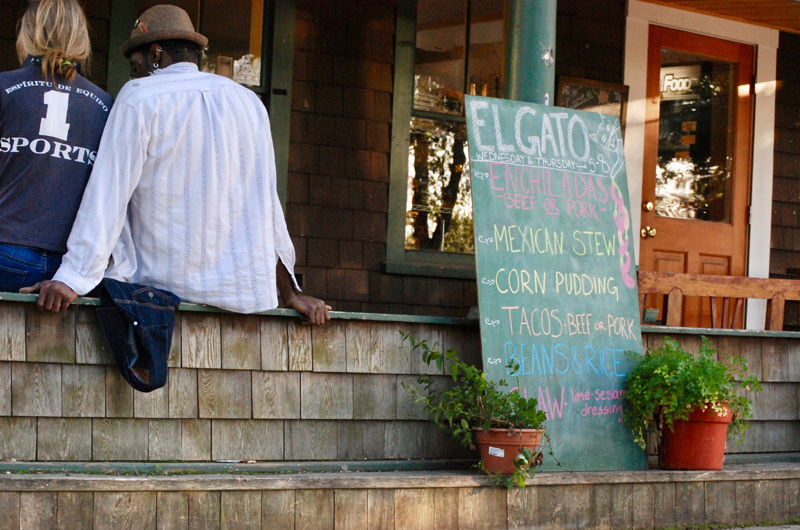 Spring Sheldon’s El Gato Mexican pop-up at The Larder in Vineyard Haven was a hit this summer, and she reprised it this week on Wednesday and Thursday night. So delicious. Of course, because I am such a wackadoodle, I didn’t even order the tacos — or the enchiladas — when I went Wednesday night. I am obsessed with sides, so I had one of each: Beans (topped with a little crumbled cotija) and rice (jasmine or basmati, I think, also well-seasoned), corn pudding (lots of fresh corn and a nice hit of chili, garnished with pickled jalapenos), and a bright and sassy lime-sesame cabbage slaw with little bits of scarlet kale and a garnish of thinly sliced watermelon radishes. A little bite of this and a little bite of that — lovely. I did get a peek at the tacos. I walked up to complete strangers on the front porch and asked them what they were eating; then I spied a friend who let me examine her cardboard to-go box. Most excellent pork tacos. Sadly Spring Sheldon (and her considerable culinary chops) is on a plane back to Mexico where she spends the winter cooking. She’ll reboot her catering business on the Vineyard in May, and we hope to see a lot more of her Mexican food, too. I tell you all this not to torture you, but to urge you to keep your ear to the ground. There is a network of talented 30-something cooks on this Island who aren’t necessarily cooking in restaurants. Or if they are, you may not know them yet. Quite a few of them are here for the winter, they like to collaborate and they get restless when they’re not cooking creatively. We will be the beneficiaries. This fall, Cinnamon Starship baker Olivia Pattison took her pizza dough to Behind the Bookstore for two nights of pizza pop-ups in a wood-fired oven. Now she’s considering doing a doughnut pop-up at the Larder, and she will, like last winter, be turning her focaccia and whole grain loaves into delicious sandwiches that never seem to have the same ingredients twice. Tim Laursen and Ann Khoan, formerly of Local Smoke, and now A Moveable Feast catering, are finishing up their catering season and will be cooking a 160-pound pig at the Farm Institute this Sunday for the Fall at the Farm event. Head over there for some pulled pork and simple salads. Later in the fall, Tim and Ann will be doing an Asian pop-up or two at the Larder. Tim is a welder who has built all their cooking equipment, and he’s currently working on some new pieces. Over at Morning Glory Farm, talented baker Korilee Connelly — the woman responsible for 300 pies a day during the summer and more than 1,000 during Thanksgiving week, is now making savory pies, available to go on Friday nights at the farmstand. The first round of chicken pot pies sold out in a heartbeat last week. 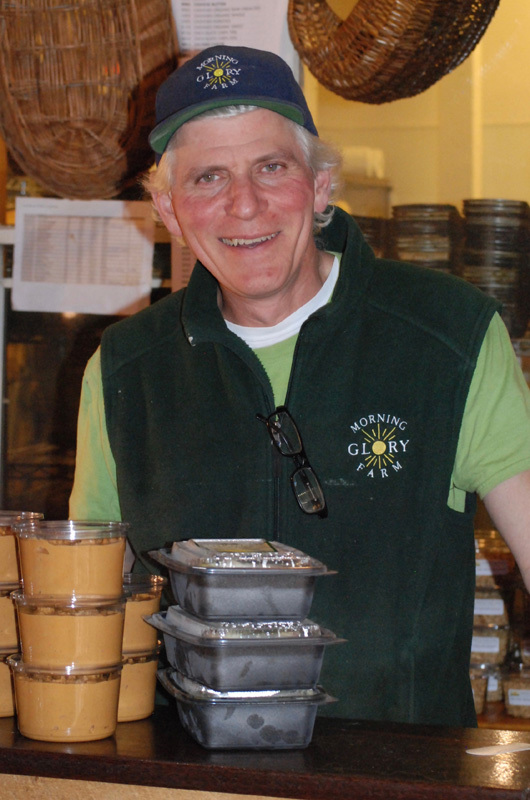 The savory pies are one of five new daily takeout themes that chef Robert Lionette introduced last week to make things more interesting for the increased number of Islanders who buy dinners to go at Morning Glory in the fall. The coolest aspect of the new themes is that Robert has invited guest chefs to participate. Mai Laothong, formerly of Sai Mai restaurant in Oak Bluffs, makes a Thai entree on Wednesdays; Albert Lattanzi provides an Italian dinner to go on Thursday. While I was chatting with Robert in the prepared food section on Wednesday, I saw a number of customers come directly to pick up the green curry chicken, or to ask about it. Robert asked Mai to make 25 per cent more this week, so clearly Thai food made with farm chicken and veggies is popular. It seems it’s not only customers who like the themed dinners — Robert’s already been approached by other chefs who would like to participate. (It always amazes me how fearless the Vineyard community is about collaborating.) Robert might have a hard time deciding where to add another chef night, since Monday’s Whole-30-style entrée and Tuesday’s Athearn family favorites have proved popular too. Lastly, one more young chef to keep an eye on: Augustus (Gus) Paquet-Whall, who grew up on the Vineyard, is officially the new head chef at State Road Restaurant. He arrived seven months ago from Chicago, but only stepped up to lead the kitchen in late August. Stand by for a really fun diner-esque menu (double double burgers, grilled caesar salad, lobster rolls, shakes, sundaes) on what has traditionally been Burger Night at State Road (Thursday). The menu debuts in two weeks. See you there.